Life has all been a bit swept away with sorting new terms, trialling new recipes, preparing for Christmas and life in general with two children, Christmas plays, parties and play dates! I think the ASDA ad with the harrassed Mum has it down to a T. The run up to Christmas should be a fuzzy and festive time, and whilst it is I think half the time most of us are doing the obligatory swan impression, calm and seren to the world but legs paddling as fast as they can behind the scenes! Be it a faith celebration or a seasonal celebration, the Christmas period holds many sacred traditions, a lot of which focus on foods. I think most families will have a traditional Christmas fruit cake, that only a few people like but it has to be there, the same with Christmas puddings which tend to be purely a vessel for carrying all types of alcohol laden creams to your mouth… and of course sprouts. I point blank refuse to make my children eat them, luckily my eldest adores them, my youngest not so, but I do remember every Christmas lunch being spoilt by the presence of a deadly green threat on my plate – that had admittedly been boiled to within an inch of it’s life. For me as a Crafty Cooks leader, it’s the same, for the last two weeks we always do mince pies and stained glass biscuits! This year I trialled a new type of mince pie in the shape of a lovely big star! It seemed to make sense, kids love something star shaped and they’re a bit different to the run of the mill pies you get in the shops. Each week we have a little activity time, normally the kids learn where food comes from and get to try some new foods, this week though with Christmas coming we made some spectacular little Christmas trees, the idea is so simple, yet so effective. Take one ice cream cone and put it on a plate upside down, cover in melted white chocolate, sprinkle on some dessicated coconut and add silver balls – beautiful! The idea is that they can sit on a cupcake with a hidden sweet beneath, we however, simply ate them!! Rub together the flour and butter, add the sugar and enough orange juice to make a nice ball. Posted in Uncategorized and tagged christmas cooking, mince pies. Bookmark the permalink. Last week in class we made beetroot and chocolate cakes, surprisingly the kids were very much accepting of the idea, many of the adults however, slightly less so (today I made a big one for a family event and it was tried under threat of death and they all reluctantly admitted it actually was quite nice!) It’s funny how we always talk about fussy eating kids and then are so reluctant or just plain trepidatious to try anything new ourselves! Anyway, in the kids trundled with happy little faces and then came the time to uncover the days ingredients, the little bowl of beetroot had some stumped, but there were a few who knew exactly what it was and not one of them turned up their nose at the idea, in fact we had a problem stopping some of them from eating it all straight away – oddly to a table of 2-4year olds the idea that beetroot gave you pink wee made it even more appealing! We made our cakes pureeing up the beetroot with me trying my hardest to contain as much of it as possible within the container, and stuck them in the oven. For activity time this week we looked at foods that grow under the ground and then had a taste of beetroot, boiled and also pickled. Even those wary of the food couldn’t resist using it to paint their lips and make themselves look beautiful, the boys even had a sneaky try but opted more to paint their tongues and look like monsters! Without realising they’d had a little taste.. and it was quite nice, so they had a nibble… and then it was gone! The cakes themselves are lovely, really moist and not too beetrooty in taste fabulous with custard!! When my four year got home from school he saw the debris and insisted we make some for him straight away, so we dirtied the freshly washed utensils and started all over again, he has been bemoaning the fact we don’t bake together as much ow he is at school so it was lovely to do something like this with him, cooking is quite a companionable activity where little snippets of the day leak out as you mindlessly chatter. Cakes made and in the oven… when he spots a melon, ‘let’s make melon cakes’ he chirps. I try to explain that melon doesn’t really go in cake but having just piled beetroot into a cake mix it didn’t really wash and who am I to quash a child’s thirst to experiment in the kitchen and so we set about making melon cakes! He decided that we should puree a large slice as we did with the beetroot, I believe the reasoning behind this was because he liked the machinery involved and nothing of a more technical nature. I must admit I was very dubious, the melon was obviously very slushy but we carried on regardless using the recipe below minus the chocolate and 20 minutes later out melon cakes were ready! They were slightly sticky, smelt, well… melony and tasted pretty darned good! They had a bit of a tropical feeling to them, almost like a cocktail of a cake, very sweet so would probably work without any sugar at all and the stickiness made them tasted almost caramelised – all in all an amazing success! Eat your heart out Heston! Last week was the celebration of Diwali and we like a good excuse to try something new here at Crafty Cooks and so all the little cooks set about making some delicious samosa’s – though not quite authentic, as made with pastry they went down a storm. I’m always slightly concerned when I do anything different, it only takes one or two overly dubious children to put the entire class off of their farings, but each class ate them up with great gusto, just the same as last years chefs. The recipe is very simple, cold mashed potato, peas and a bit of tumeric and garam masala and the result is a beautifully yellow pasty. Many of the kids had eaten curry before, but for some this was a whole new experience with tastes and smells they had never experienced before. The kids did fantastically, the first class not aided in any way by diabolical traffic meaning they arrived late and had to hurry through,speedily chopping their butter, rubbing it in to their flour and making a beautiful pastry! We learnt a bit about the story of Diwali whilst the samosas cooked, of Rama and Sita, the warrior prince and his beautiful wife, the evil king with ten heads and twenty arms who stole this beautiful wife, and the hero monkey king who helped to find her. I asked the kids what Daddy would do if Mummy got stolen – expecting them to say go and find her, most did but one little, rather astute chap said he doubted his Daddy would go looking, Mummy nagged far too much! Another one, the sweetest child you could meet, replied ‘I’d punch him in the face’, his Mother looked slightly shocked and tried to explain that you should ask very nicely if he could please hand her back and there was no need for violence, but he wasn’t having any of it, there is, it would seem, a time and a place for manners and this would not be one of them! It seemed a foolproof plan to win back your princess until one of the Mums threw a bit of a conundrum into the equation with two little words… which face? They also decided that the evil king was probably evil on account of having ten heads, twenty arms and most likely suffering an intolerable level of bullying as a boy, some even felt a bit sorry for the king and thought maybe he could keep her as he’s probably very nice once you get to know him and the prince was wealthy and handsome and would find a new princess in no time! Anyway, having won them round to the fact the king being killed by a poisonous arrow and the prince and princess being reunited was a good thing, we talked about the lights to guide them home and how it is known as the festival of lights and in a final flurry of Diwali fun we made some fab little chocolate sparklers. These are dead simple. Take one chocolate finger, dip the end into hot water, and then into a cup of sprinkles and hey presto! 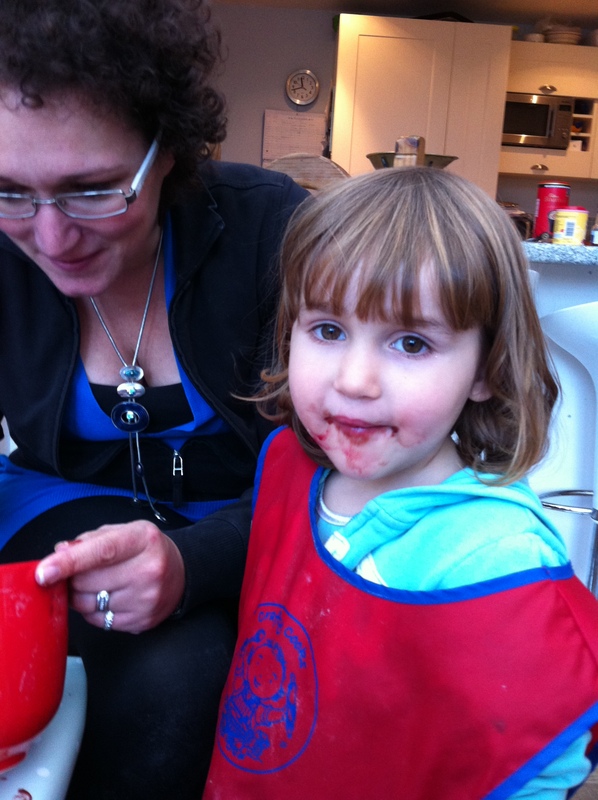 Posted in Uncategorized and tagged Cooking, diwali, kids, preschool, samosa. Bookmark the permalink. I seem to be have been swamped with life just recently, dance shows, gym shows, Children in need, Christmas tombolas and of course the new term juggle where everybody always wants the same day and I just can’t squeeze them all in! The blog has taken a bit of a backseat and so I am going to do a bit of playing catch up, starting with Halloween! Halloween seems a bit of a controversial topic with many people, most people seem to either love it or hate it and some just tolerate it for the kids. Before I had kids I hated it. We lived on a main road and the only people that knocked were teenagers who wanted a fag! Now though I live around a lovely green with loads of kids that my children play with and now, I actually enjoy it. We all know where everyone lives and who’s house to knock on, we also follow the pumpkin code of conduct. This year we were invited toa little party at a neighbours, obviously you don’t want to go empty handed and so we thought of all sorts of creative things to make and set our hearts on some jelly worms we had seen on facebook. The premise of the idea is that you tightly pack some drinking straws in a container and fill with a jelly mixture. Well, we failed miserably, despite tight packing, adding copious amounts of gelatine to try and thicken the jelly, a variety of containers, even resorting to bunging up the bottoms with blu tac! The result was a whole load of gooey straws in the bin and jelly that when it set was so stiff you could eat it like a biscuit! 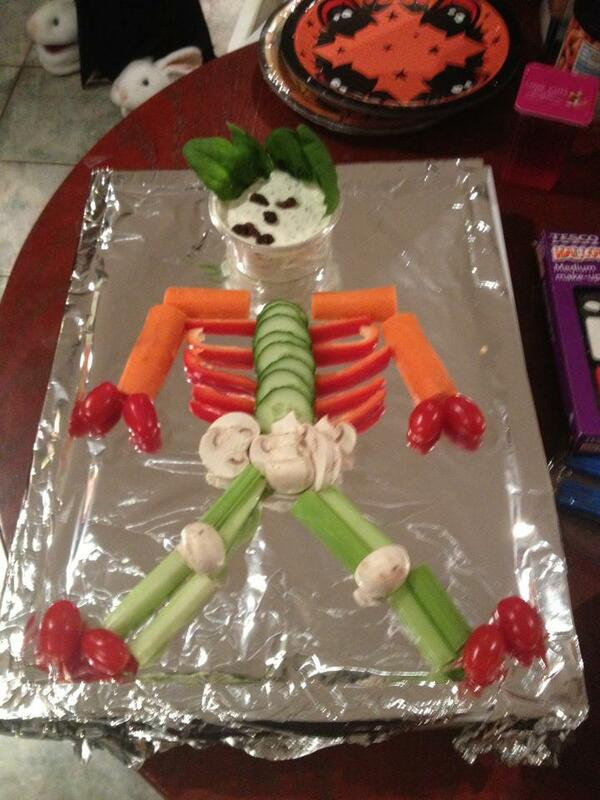 Plan B went far better, we made a skeleton out of an array of veggies and even bought some celery for the occasion. My kids have never been fans before but after a sneaky steal, my eldest decided that he loved it – result! Whilst herding my boys around a very cold and blustery park this morning we bumped into a lady who had come to a workshop some time ago. Her boy and my boy are now at school together and headed off to the skatepark to compare scooter skills and we dutifully trudged behind them making idle, sleepy morning chit cat through chattering teeth. ‘Still cooking?’ she asked. I told her yes, more than ever now both kids were at school and I had less of a childcare shuffle to contend with. ‘Do you enjoy it?’ was the next question. I found it slightly odd that someone would even contemplate I didn’t and then realised just how lucky I am. My hellish commute means wandering down the stairs or a small trip to a local hall and my colleagues well…. Need I say more? You can be in the foulest of moods when the doorbell rings and then lots of excited little feet tipper tapper in, asking what we’re cooking, and their enthusiasm is contagious. ‘But don’t you fancy a change? Aren’t you bored?’ True, sometimes I need a new challenge but there are plenty of those to create to build the business, and as for bored…nope! 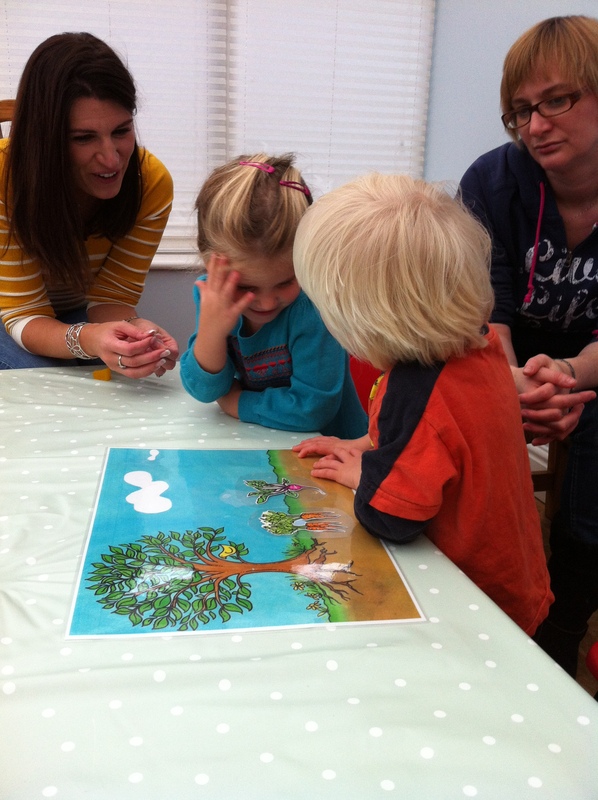 Though every class in a given week makes the same recipe, each class is so very different and to me what we’re making is an aside to the little personalities I’m getting to know and chat to and the friendly chatter of the parents, who, over the course of a term, invariably become friends, it’s a little like hosting lots of big play dates really, just without the stress that mine will show themselves up by doing something naughty! Aside from all of this there is also the complete ease in which it fits around my own family. I have two young boys who I want to be a full time mum to, to be there with them in the holidays and this way I can. I’m very lucky! 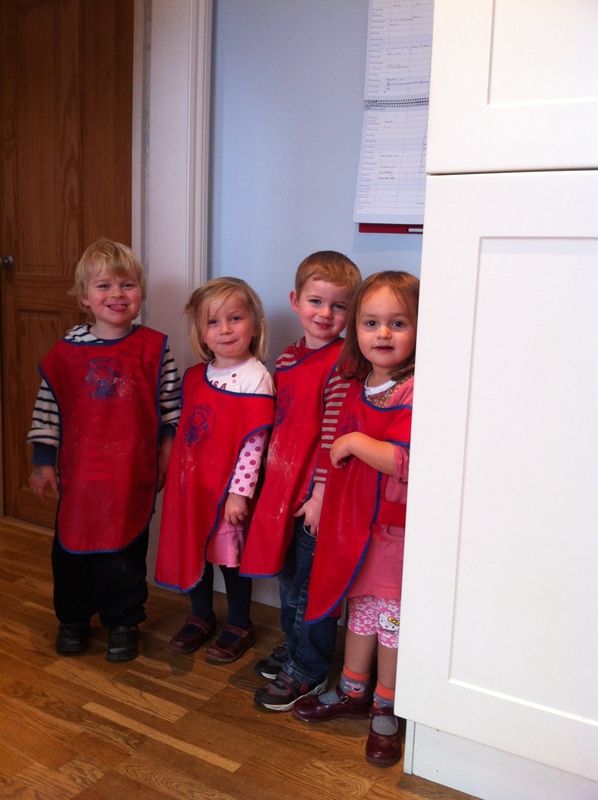 Posted in Uncategorized and tagged Cooking, franchise, kids, workingmums. Bookmark the permalink. 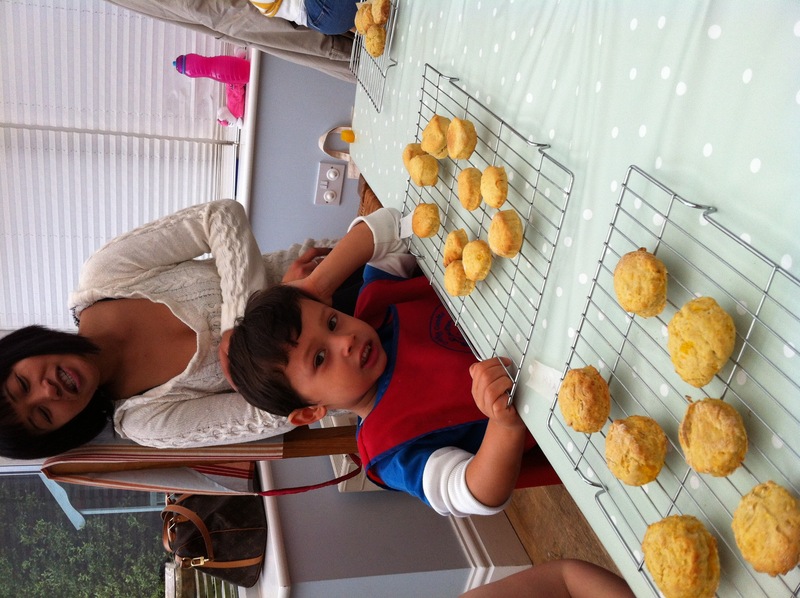 This week we are making delicious Pumpkin scones. A recipe greeted with mild trepidation by adult and child alike, but, as always they left carrying far fewer than they had made. Most children know about the funny or scary faced pumpkins we carve out and light up, but most children also think they are simply a novelty torch for halloween and so it comes as a bit of a shock that we can actually eat them! After we’d had a little tasting session we set about looking where foods come from, underground, over ground or on a tree. 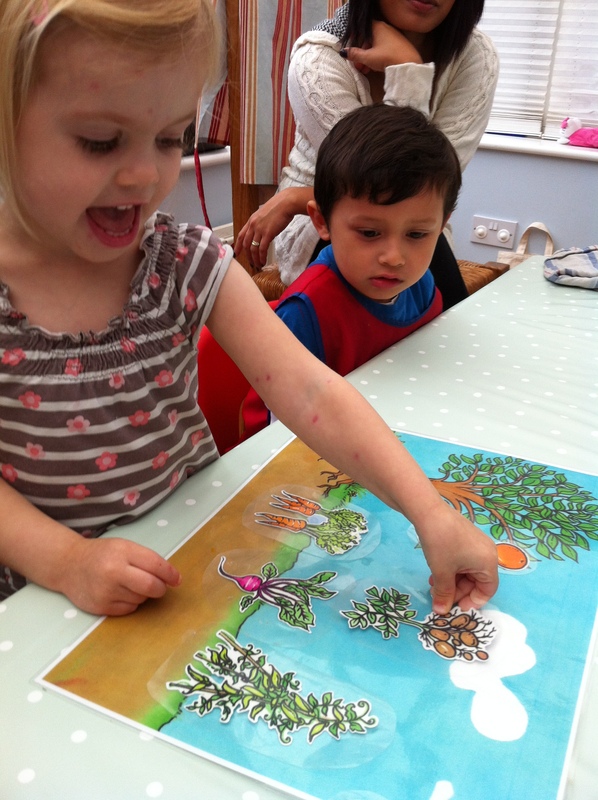 We discussed just how a big the tree would have to be to grow pumpkins and decided that would just be silly! But how about carrots, onions, pears and plums? They got them mostly right, with the exception of the flying potatoes… lets hope it doesn’t start raining! 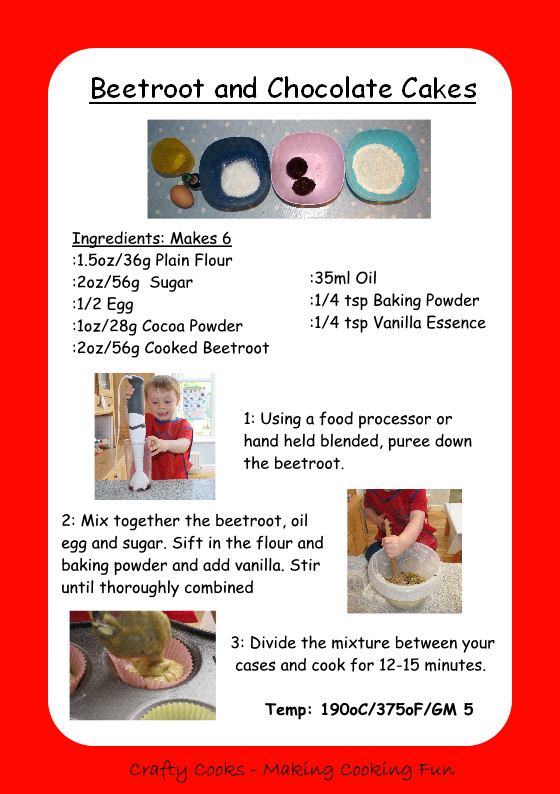 Posted in Uncategorized and tagged Cooking, cookingwithkids children, kids, potatoes, preschoolers, pumpkin. Bookmark the permalink. Wow, it’s been a very busy week and now Saturday afternoon finds me and my boys snuggled up watching a Disney movie. My eldest adores dancing and gymnastics and with a couple of shows in the pipeline he’s feeling rather overworked and underpaid, I can’t say I blame him, he’s working very hard and more than ready for half term! I am equally exhausted, the week has seen busy classes, an evening with the local cub group talking about food safety and a chat on cooking with kids on the local radio. The cub group was good fun, I don’t get out much, can you tell? I was asked to give a talk about safety and hygiene in the kitchen to go towards the boys cooking badge. I sat for many an hour pondering how to make this less than deathly dull. It’s not particularly the most scintillating subject, especially for a group of ten year olds that would rather be playing football, so I grew some mould, got some pictures and gave it my best shot. We covered basic things, where you need to be careful in the kitchen, types of burns, knife safety all the usual. We talked about what to check the food for and I showed them my mouldy baked beans – much boy over reaction of urghs and yuks ensued, they weren’t even particularly mouldy. How does that work? You leave some beans in your fridge for a few days then when you go to finish them they’re all green and furry – you deliberately leave some beans to get mouldy and they last for an age! I must admit I was slightly nervous of a health and safety spot check in which I had to try and convince them that the mould was supposed to be growing in the fridge. We went on to chatter, and with a group of boys chatter really is the only suitable word, about personal hygiene and why oh why Mums always tell you to wash your hands so question one, put your hand up if you can HONESTLY say you never pick your nose. Well, of the ten kids about two put their hands up, then slowly lowered them back down again. Why did that matter? Well because our noses are a haven for the lovely Staphylococcus aureus. We looked at several bacteria, asked how many of them ALWAYS washed their hands after going to the toilet and obviously the word poo was mentioned more than once in relation to the spread of germs causing much merriment amongst the boys who made the very most of the opportunity to legitimately say this most desired word out loud, in public without being told off! 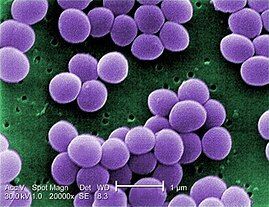 The favourite of bacteria was the now renamed hexbug – known more commonly to you and I as Salmonella. I’d like to say that my little chat has made the boys more aware of why we must be hygienic and that each and every time they go the toilet they’ll wash their hands, and that there will be a few more lads about town whose fingers aren’t constantly lodged in a nostril, but alas, I fear that instead they may be actively collecting bacteria in an attempt to see who can win the race to their own, private stinky boy badge!